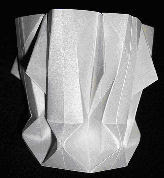 The last two days have been spent developing an earlier hexagonal base proto-folding into a flower vase. I have called it the Bulb-Stem-Flower Vase because that is what it looks like. The base of the vase has indentations which look like bulbs. The mid section has slits which look like stems. 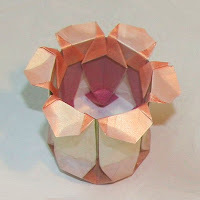 The top section has projections which look like petals. And the interior has foldings which look like the internal structure of a flower. 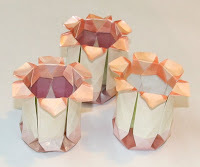 I developed a colored paper pattern which emphasizes these elements and also assists with folding. This is fortunate, because the model is based on multiples of five which can be difficult to fold accurately, even with a division template. The most difficult part of the model may well be the process of printing the design on an inkjet printer so that the front and back are in the same orientation and the setting has been adjusted so that the ink dries between coatings and does not smudge. The shinier the paper, the longer this takes. It is also necessary to allow the paper to dry completely before folding the model or you will add to the smudges. Here is how this model began its life. Apart from the coloring, there is actually not much that is different between this model and its development. The three models shown here were printed on different papers: flat white 80#text copy paper, Wausau 70#text Royal Metallics White Gold paper (white with a pale yellow glint) and Gruppo Cordenons 80#text Stardream Opal metallic paper (very pale yellow with a white sheen). The plain copy paper (front right) worked fairly well. It had the clearest brightest colors and folded well. This example lacks the maroon internal flower coloring which was added to the later models. The Wausau paper (front left) was the least successful. The ink ran and smudged badly, something which may have been avoided by allowing the printing on the front of the sheet to dry before printing the pattern on the back. One of the edges tore slightly while being folded. The paper is thinner than the 80#text but still holds its shape well. Its main advantage is that it has a slight sheen which shines through the printed colors. The Stardream paper (center back) was the most successful. It also smudged, but not nearly as badly. It was good to fold, did not tear and was a perfect weight. The mica coating on the paper makes it water resistant but I think the inkjet colors remain water soluble even when dry. While the printed colors on this paper are the most muted of the three, the sheen which shows through them is wonderful. I would like to think that the mica coating on the paper makes it water resistant but I think the inkjet colors on top of it will prove to be water soluble. Here are the paper patterns for the front and the back of the vase. The front pattern is 8 inches wide by a little over 9 inches tall so it will print on either American Letter or A4 paper. Make sure your printer centers the images on the paper. Do a test run to make sure that you put your paper back in the tray in the correct orientation for correct back-to-back printing. The pattern for the back of the paper has been extended around the edges to allow for sloppy printer alignment. It is about 8.2 inches wide so it should still print on an A4 sheet. Be sure to print the images out in their actual size. Do not let our printer adjust them to fit the page or they may not line up, even with the in-built fudge factor. Here are the crease patterns. Please note that the crease patterns are shown on the "colored" side of the paper and not the "white" (back) side as per usual. This model is easiest to make if you work from the front. Start by making the preliminary grid creasings. It should be relatively easy to find landmarks for these on the colored pattern. Next add the mountain creases outlining the three axes. Begin the third diagram by firming up the creases in that picture which you have already made. Now add the valley fold spokes. These are made by bringing two mountain fold spokes in to meet on the line which connects the center points of the edges. Be careful not to fold these lines all the way to the apex as this will make it difficult to form the "bulb" at the base. The creases around the edge are formed by halving the tips of the overlapping material which ends up on the inside of the vase. 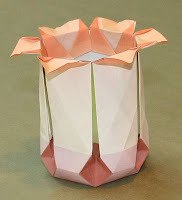 Turn the results over the top to form the petals. Shape them as you wish. Your model is complete. Send me a photo. This has been a somewhat frustrating model to develop. Wrestling with color printers is not my idea of fun, especially when they ruin perfectly good pieces of special paper. I managed to contribute to this process by making more "fool folds" than usual. The camera angles are designed to hide them. A "fool fold" is a fold you make in the wrong place or in the wrong direction through a deficiency of brain juice which is at least temporary in nature. The fact that the color printer is housed in a dark corner of my husband's relatively impenetrable study did not help my humor. Navigating Peter's study needs mountaineering gear, a compass and a good health insurance plan. First he insists on littering it with all the packing boxes which his computer equipment came in. He insists that this is absolutely necessary "so I can move them safely elsewhere". Then he uses the floor as essential "flat space" to store just about everything so that it "can be easily seen". This does not work too well as he is constantly loosing things under the many layers which accumulate on and around the box collection. He would make an excellent member of Monty Python's Society for Putting Things on Top of Other Things. It is hard for me not to add to the layers by falling on top of them, which would probably make me an honorary Member. In spite of the frustrations, the model has been completed. I think the results are worth it. Do you? It turns out that bulb-like sinkings in vases are not unique inventions of mine. Christine Edison provides details of a Septimus Vase inspired by Phillip Chapmen Bell which also has these items surrounding the basal section. I had not seen either Edison's or Chapmen Bell's models before I came up with mine. As is often the case, the inventions were independently made in a roughly similar time period.